Randy's Little Kyoto in Juho, and my new friend Accord's skins at Neko's shop. Fabulous, glowing, luminous. Don't forget to visit the exquisite sento (or Japanese communal bath) for a bit of skinship. They have even thoughtfully provided towels and yukata for post-bath lounging. Here I am in one of Accord's skin Chihiro Skin Bihada (medium) in Mai make-up. 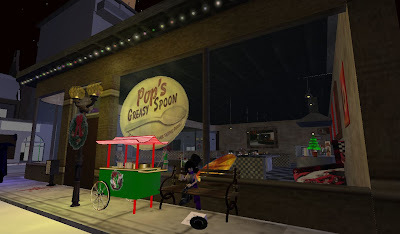 Pop's Greasy Spoon at Vampire Empire. Best hotcakes and poptarts this side of the metaverse. Remember to be kind to Grendel, the sweetest pixie you'll ever meet and say Hi from me.